Did you know the first single line cable tramway was opened in Matlock on the 28th March 1893? The tramway was the steepest anywhere in the world its gradient was measured at one in five and a half over its five eighths of a mile length. It carried more than a quarter of a million passengers in its first nine months and remained in use until September 1927. The tram terminus shelter can still be seen at the end of Hall Leys Park near Crown Square. The main passengers who used the tram were people visiting the impressive John Smedley Hydo Baths (now County Hall) on Bank Road which opened in 1853. John Smedley was not the first to recognise and exploit the benefits of water treatment on various illnesses. However it was his conviction and enterprise which established Hydrotherapy firmly in Matlock. For a century made it one of the most celebrated centres of the “water cure”. By the outbreak of war in 1939, Smedley’s Hydro was world famous, its guests having included Ivor Novello and Robert Louis Stevenson. 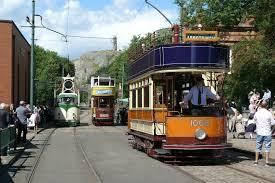 If you are interested in Trams the National Tramway Museum is located at Crich, a few miles from Matlock. If you are interested in visiting, contact us first as we can provide our guests with special offers for attractions in Matlock and the Peak District. The museum contains over 60 trams built between 1900 and 1930 and is set within Crich Tramway Village. Working trams run daily and special events are held throughout the year.